The familiar narrative taking shape should sound strikingly familiar to the lead up to NATO intervention in Libya in 2011. There, just as in Syria, heavily armed terrorists, not “pro-democracy activists” were waging war against Tripoli. Intentionally misrepresenting the facts on the ground and the greater geopolitical context the Libyan conflict fit into, NATO successfully sold direct military intervention in Libya to the world. The “democratization” of Libya included daily NATO sorties into Libya, bombing the North African nation from air, while terrorist armies marched below, fully armed and equipped by NATO member states. As the conflict drew to a close, with the Libyan government decimated, infrastructure nationwide destroyed, and very real atrocities (including genocide) unfolding just as NATO had falsely claimed were being perpetrated by Tripoli months earlier, it was clear that decimation, not democracy was the end result. 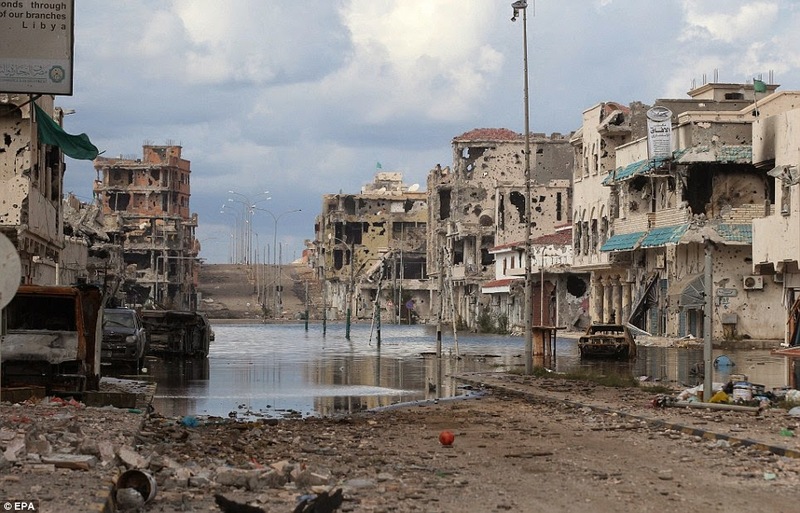 Years after the decimation of Libya, the country remains in flames. There exists no stable government and the “pro-democracy freedom fighters” NATO assisted into power are now clearly exposed as sectarian extremists. The Associated Press article, “Libya’s Islamist militias claim control of capital,” encapsulates the utter failure of NATO’s so-called “humanitarian intervention” and the alleged “democracy” their military intervention was to pave the way for. The AP reports that Tripoli, Libya, has been overrun by radical militants, the very militants NATO had been providing air cover for in 2011 and who news outlets like AP had claimed were “pro-democracy rebels.” The ongoing fighting is a result of dissatisfaction over hapless elections carried out symbolically, but finalized through heavily armed chaos across the nation. Of course, to call what NATO did in Libya a “failure,” one would have to believe that NATO was actually concerned about a humanitarian crisis it itself helped create and further compounded with its intervention in the first place. One would also have to believe that “democracy,” and not projecting Western hegemony into Northern Africa, was its true objective.It is clear however, that a divided and weak Libya serves the West’s purposes better than a strong, united, and anti-Western Libya under the control of a sovereignty-minded leader like Muammar Qaddafi.…So in Syria Considering the abject failure of NATO’s stated objectives, and the revelation of its true designs in North Africa, why then does anyone suspect similar maneuvering against Syria will turn out any differently? Already, hostilities in Syria have dragged on long enough to reveal the true nature of those fighting the government in Damascus. 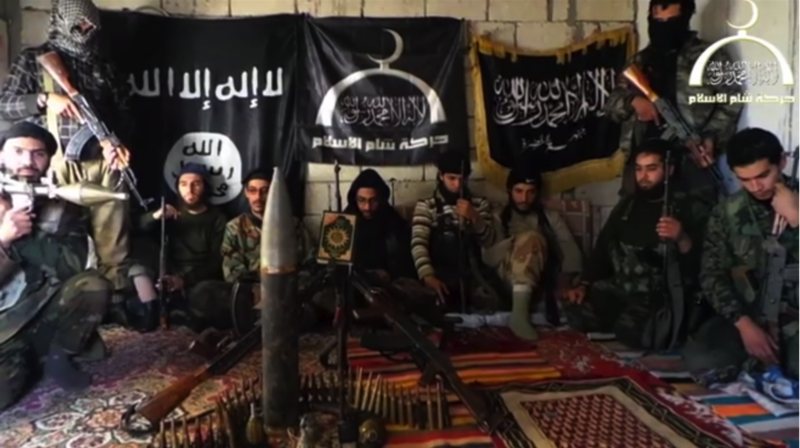 Far from “pro-democracy rebels,” as in Libya, the militants fighting in Syria adhere to a radical, divergent form of Islam aligned with or directly influence by Al Qaeda. Careful analysis of recent Western media headlines reveal objectives like “democracy” and “freedom” have been entirely expunged from the narrative, with extremist groups like ISIS/ISIL being differentiated from “moderates,” but both groups clearly leaning toward extremist ideology inconsistent with an inclusive political agenda or democracy. The continued push by the United States toward regime change in Syria is betrayed by its dishonesty in Libya, where clearly the agenda of democracy was a canard to cover up military aggression, regime change, exploitation, and the Balkanization of a strong regional adversary. Likewise in Syria, the continuously rotating pretexts cited by the US to continue intervening in the region are but canards to obscure a similar agenda of defeating a regional adversary at any cost, including the predictable destruction, disintegration, and perpetual abysmal plunge of Syrian society at the hands of heavily armed extremist groups enabled and intentionally empowered by American meddling. The price Libya has paid and continues to pay with its blood and at the expense of stability and progress, serves as a warning of what will befall other nations subjected to foreign meddling. From Iraq to Libya, it is clear that those selected for Western intervention will not be granted the peace, prosperity, and freedom they are promised ahead of bombing campaigns, troop incursions, and occupation, but rather subjected to the various methods of subjugation inherent with all imperial endeavors. The most common and straight forward method of subjugation is divide and conquer. The US intentionally left Libya in the hands of disparate groups of armed fanatics, knowing that Libya would never again pose an obstacle for Western hegemony in Africa. Likewise, it has cultivated a large variety of infighting extremists plaguing Syria, that if successful in overthrowing the inclusive, secular government of Syria, will subject the Syrian population to perpetual infighting, genocide, instability, and sociopolitical economic regression.While the US continuously insists it is promoting democracy and freedom globally, it holds the portfolio instead of a practiced and accomplished imperialist. It has divided and destroyed nation after nation, building in the cinders of its destructive wake, chaos it can manipulate and wring profit and power from perpetually. As it positions itself to intervene in Syria, it attempts to compel the general public that this time, this time it will succeed in crushing the enemies of freedom, and planting the seeds of lasting egalitarian democracy. Unfortunately, despite believing it has sufficiently dressed its true agenda up in the trappings of such notions of democracy and instilling stability, it makes these assurances regarding its intentions in Syria in stark nakedness. Even the fig leaf of manufactured consent provided by its extensive propaganda networks, seems hopelessly beyond its reach. As Libya burns across the headlines, the United States fully plans to visit this very travesty upon yet another nation. Ulson Gunnar, a New York-based geopolitical analyst and writer especially for the online magazine “New Eastern Outlook”.